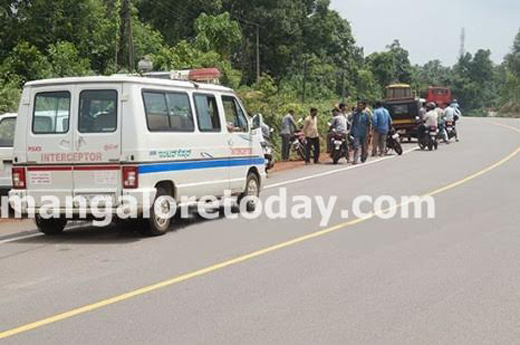 Karkala, June 17, 2015 : A rider narrowly escaped from being hurt by a lorry which was moving backwards near Nitte Lemina Cross on Tuesday June 16. 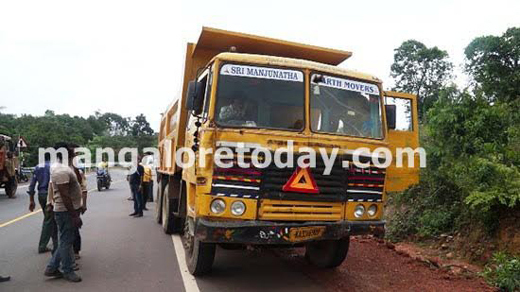 The scene occurred when the Tipper lorry driver was trying to escape from the police who were inspecting the vehicles near Nitte Lemina cross. Noticing the police the driver slowly started moving backwards and crashed the bike which was coming behind the lorry. The bike rider blew horn and screamed out, but all his efforts went in vain. The driver tried to run away after the crash but the auto drivers caught him and handed over to the police. The driver has been identified as Chandu. The reason he was trying to escape was that he was not wearing the uniform. The bike rider had bought Jasmine flowers form the market, damaged in the incident. He works as a flower merchant. A case has been registered at the local police station.